It seems that as soon as mid-April hits, teachers start fantasizing about what their classroom will be like next year. We start thinking of all of the ways to improve what we have been doing this year. We say things like, "Next year, I will always have my attendance in on time" or "I'm going to be so much more organized next year." Often, this is the time of the year when administration lets you know what you'll be teaching next year but now is not the time to put in a lot of thought of what your fall will look like. Your current students deserve you. All of you. They deserve the same teacher they had on the first day of school several months ago. The energized you. The excited you. The creative you! Sure, you're tired. I totally get it. We are on the downhill slide of the school year. Testing is finishing up. There is so much paperwork and report cards due soon. You still have so many more standards to hit before the end of the year and you're JUST DONE. When you think of next year, you get excited again. A fresh start is exactly what you need right now. 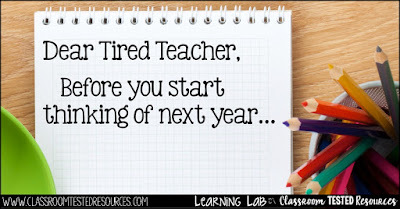 Your teacher instinct has you cleaning and planning for a new school year. 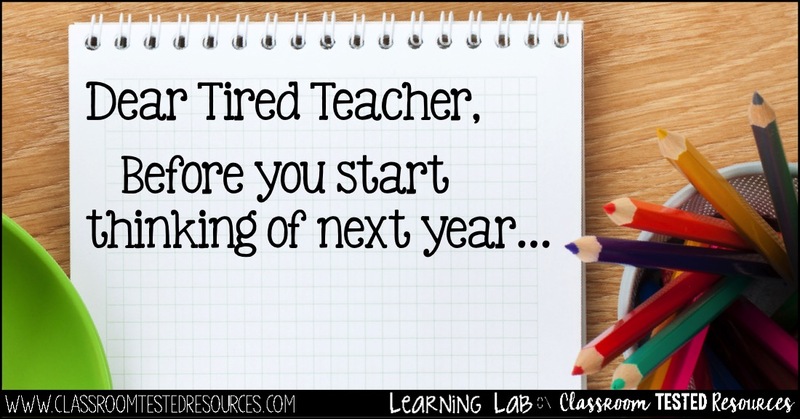 Enjoy these last few weeks with your students. Soak up the time you have left with them. Start a fun project together. Enjoy the changing weather and take some of your lessons outside. Give them the best you have. Finish this year strong. They deserve it. Before you know it, summer will be here. You'll have tons of time to daydream and plan for the next school year then. For now, enjoy living in the moment. If you are looking for some interesting activities and projects to end your year, you might be interested in some of my engaging EOY activities.